Our Valentine Ideas contest for 2009 is over and the winners have been chosen! If you take a few minutes to browse through the entries, you'll understand what a difficult job it was to choose the best. I'm SO GLAD that I handed the responsibility over to some friends for judging so I could be impartial. Special thanks to Rose, Carmel, and Kate for their time and effort in deliberating and choosing the winning ideas for Valentines Day. I'd also like to thank every single person who took the time to enter. I really enjoyed reading your creative ideas for Valentines Day, and will definitely be using some of them myself throughout the year. Even though the contest is over, you can still share your own Valentine ideas. We'll never have too many creative recipes or gift ideas to treat our friends and loved ones extra special all year round. 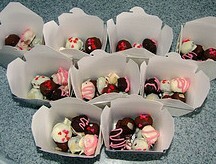 Some of my favorite chocolate candy sellers have sponsored our exciting Valentine's Day Contest for 2009! Here're the prizes and the winners! Just Because Baskets donated one of their scrumptious gift baskets. It's called "Sweets for my Sweetie". This wonderful indulgence goes to Livia for her Teddy Bear Cake that she made for her husband. You may want to go over and check out their selection of gorgeous gift baskets to pamper someone you love with an extra special surprise. The lucky winner of this memorable Retro Chocolate Fantasy Gift Box from our friends at Candy Crate is Daphne for her very cute valentine craft for kids valentine hug card idea. Candy Crate has a huge range of candies to choose from with a specialty of helping you find those nostalgic treats that can send a loved one down memory lane. Do you have someone you want to spoil with the tastes of bygone years? They'll be delighted! Finally, we've got the winners of the gift cards! The Candyland Crafts gift card goes to Heather for her Double Chocolate Torte Valentine cake. Candlyand Crafts has just about anything you need to make your own unique Valentine Gifs, whether it be molded chocolates, specialty cakes, hard candy or more. They have all the supplies necessary including the packaging for your Valentine party favors! I hope you enjoy picking out something fun to make. Candy Crate is another story! My "judges" had trouble deciding on a fourth and final winner. The competition was so fierce that I had to divide this one in half to keep the peace. A $15 gift card will be sent to Heidi for her unique valentine gift scavenger hunt idea and another $15 gift card will go to Jessica for her romantic valentines day ideas. 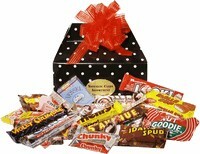 At Candy Direct you'll find a large selection of bulk candy as well as old favorites. So you girls should have fun picking out something yummy! Congratulations ladies! Thanks again to everyone who took the time to share their creative Valentine ideas. You guys are great! Don't stop now, I'd love to see more of your work in the weeks and months ahead. After all, Easter is just around the corner! Share your Valentine's Day Ideas for making Valentine's Day extra special! Tell us all the details. Your submission will be it's own page, so include a few photos if you're able, so we can see what you've created. Your Valentine idea will appear on a Web page exactly the way you enter it here. You can wrap a word in square brackets to make it appear bold. For example [my story] would show as my story on the Web page containing your story. Valentine Crafts for Kids - Send a Valentine HUG!